Vale SA (ADR) Earnings: Is There Beauty Hidden Inside This Beast? Vale still has one lingering problem; but it's doing the right things to deal with it. Vale SA (ADR) (NYSE:VALE) posted a third quarter loss of $0.28 a share on revenue of $9.2 billion. Both numbers missed consensus estimates by wide margins. The big problem? Iron ore prices remain in the doldrums. This, however, is no surprise to anyone watching the industry, and is hiding solid underlying performance at this giant miner. To be fair, Vale's results were affected heavily by exchange rates, which amounted to a $1.9 billion drag. That pushed a weak quarter well into the red. For comparison, the company earned nearly $0.70 a share in the third quarter of 2013 and $0.28 a share in the second quarter of this year. Neither of those periods were as heavily affected by currency issues. Analysts had been expecting earnings of around $0.32 a share. Currency, however, had little to do with the top line decline of about 26%, year over year, in the quarter. The company missed consensus revenue estimates by around $860 million. And the big issue there was iron ore. Iron ore pellet prices feel 13% sequentially for the second and third quarter, and Iron ore fines prices fell even more over the period, dropping around 19%. This overshadowed relatively strong performance on the operations front in Vale's iron business, with production reaching record levels. Also hidden beneath iron ore's price weakness were solid performances in the company's nickle and copper operations, which helped drive a nearly 15% year-over-year improvement in the company's base metal sales. Vale is also doing a good job of keeping costs across the company in check. For example, Sales, General & Administrative costs are down nearly 25% through the first nine months of the year. Cost cutting is the right action to take in tough markets. Unfortunately for Vale and its shareholders, iron ore makes up the lion's share of the company's sales, accounting for roughly 66% of the top line in the quarter. Note that iron ore accounted for about 75% of sales in the year-ago period when prices were stronger. But Vale isn't alone in this iron ore conundrum. BHP Billiton (NYSE:BHP) and Rio Tinto (NYSE:RIO) are also struggling through low prices. However, none of these giant industry players is helping the situation. Vale explained the problem succinctly in its earnings release: "Production of iron ore remained strong, mainly boosted by expansions of the majors. At the same time, demand coming basically from steel producers in China – the largest iron ore consumer -- increased only moderately. 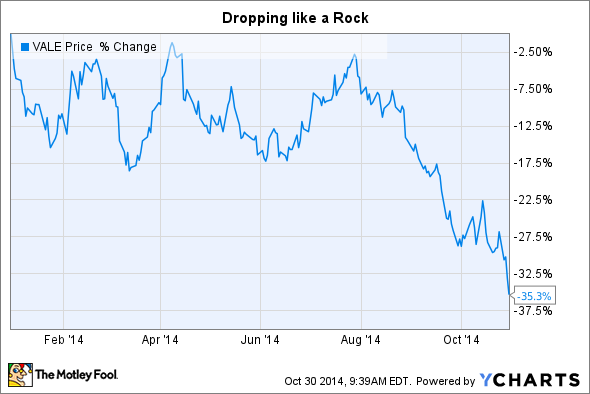 Together, these combined effects have been putting downward pressure on iron ore prices." This, of course, begs the question of why keep expanding production to record levels, like Vale highlighted as a positive? The answer is that demand for steel, which requires iron ore, is still growing, about 2% globally this year. Demand growth, though slow, isn't likely to stop in the near future because emerging economies keep stepping up the socioeconomic ladder. The problem here is that building mines takes a long time. If Vale and its peers wait until prices recover they won't have the capacity to meet demand and prices will move too far in the opposite direction. So the big players, which can produce iron ore at relatively low prices, are preparing now. They are suffering in the near term, but they are also pushing higher cost mines out of the market -- which means more market share when prices do recover. While Vale isn't calling for an iron ore upturn, it did highlight positive trends it's seeing. For example, China is increasingly exporting to Southeast Asia, where "... Indonesia, Malaysia, Myanmar and the Philippines ... have more than doubled their imports since 2008." And China itself is trying to support the construction market, a big steel consumer, by loosening restrictions on home buyers, encouraging first time home purchases, and reducing down payments for current home owners. Vale's shares are down around 35% so far this year. And this less than auspicious earnings report led to a nearly 4% drop in early trading. Vale really is a hard stock to love right now and for good reason. That said, for investors with strong stomachs and constructive long-term outlooks, Vale is positioning itself well for an iron ore rebound. It just might take a little while.